Is silicone pressure sensitive adhesive (PSA) required for silicone material? 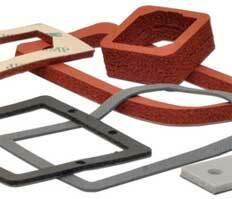 We often see silicone based adhesive specified with silicone materials. Silicone adhesives are expensive as compared to acrylic adhesives, in some cases more than 5 times the cost of acrylics. Silicone PSAs bond strength is not as good as acrylics and there are limited offerings. So why are silicone adhesives being specified? Silicone adhesives can be adhered to silicone material without surface preparation. Many fabricators do not have the technology to apply acrylics to silicone materials. However, Stockwell Elastomerics has been doing it for years. When should silicone adhesives be specified? Silicone adhesives do have their niche, they are great for very low and high temperature extremes where acrylics and rubber based adhesive lose their efficacy. Having a pressure sensitive adhesive (PSA) backing on gaskets is not required to make a good seal but is often recommended to aid in assembly. The added cost of the adhesive is offset by the time saved during assembly. For applications assistance or more information about adhesive backing for gaskets and pads, and adhesive-backed gaskets, please call Stockwell Elastomerics at 215-335-3005 or complete a contact form for assistance.